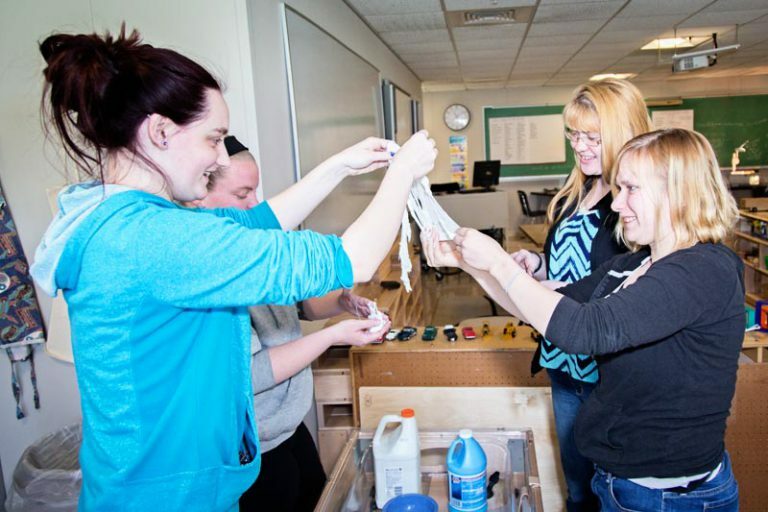 Greenfield Community College is helping meet the community’s need for well-qualified educators with its dedicated Early Childhood Education Lab classroom and a partnership with Elms College that provides a streamlined pathway to a bachelor’s degree in Early Care and Education. That’s good news for community members seeking to advance in the field of early childhood education and for young children who need care. What’s an Early Childhood Education Learning Lab? Like science labs and other campus labs, the ECE Learning Lab allows students to practice skills. All ECE classes meet in the lab classroom, a hybrid of an adult educational environment with some of the materials and furniture you’d find in an early childhood classroom. GCC’s ECE faculty believes the environment is the third teacher for young children (parents are first, classroom teachers and caregivers are second). Classroom design, layout, colors, types of materials available, and other physical factors significantly affect how and what children learn as well as their behavior and emotional well-being. With the Lab, GCC students can try out different classroom layouts, designs, and materials. They use the materials, see how things work with different layouts, and then debrief in depth with the professor and other students. This gives them a broad exposure to many possibilities. In a student teaching setting, GCC students work within an existing early childhood classroom and curriculum. The lab is a way for students to expand on that important student teaching experience and create opportunities for a two-way exchange between what students are learning at GCC and their community student teaching assignments. Head Start has already seen the effects on teacher retention and recruitment because of these increases. Teacher stability and retention are directly correlated with children’s growth and learning in ECE programs. The GCC Education department works with Head Start and other area early care and education programs and advocates for a strong workforce for all of the programs in the community. What Early Childhood Education degrees are offered at GCC? GCC offers a two-year Early Childhood Education Associate of Science degree that gives students the requirements needed for a preschool lead teacher position in a community-based program. It can get you right into the field. For those who want to move into higher level, higher paying positions in the field, GCC’s ECE Associate of Science degree feeds into the 20-month Elms Early Care and Education Bachelor of Art degree completion program. Classes are held on Saturdays at GCC and online, so students can work while attending the Elms program. While the GCC program and Elms program are very well-aligned and streamlined for GCC students, the Elms program at GCC is open to anyone with the prerequisites, not just those with a GCC associate’s degree. For information about Early Childhood Education at GCC, contact Peggy Martalock, Ph.D. at martalockp@gcc.mass.edu or 413-775-1118.